Sicilian Cassatelle with Ricotta are typically served for Carnevale in Italy. 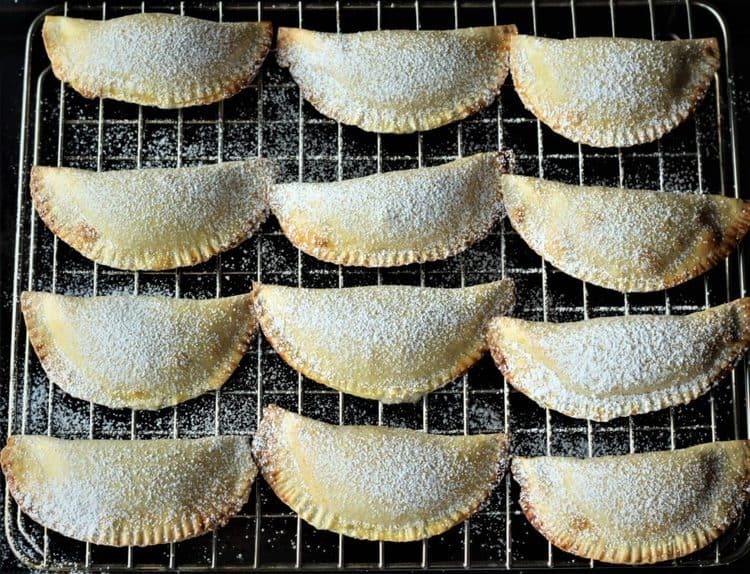 These little crescents are filled with a sweetened ricotta and can be either baked or fried. We’re in the middle of a deep freeze here in Canada but on the other side of the pond, in Italy, they’re gearing up for one of their biggest holidays of the year, Carnevale. To celebrate in style, I’m sharing this recipe for Sicilian Cassatelle with Ricotta. 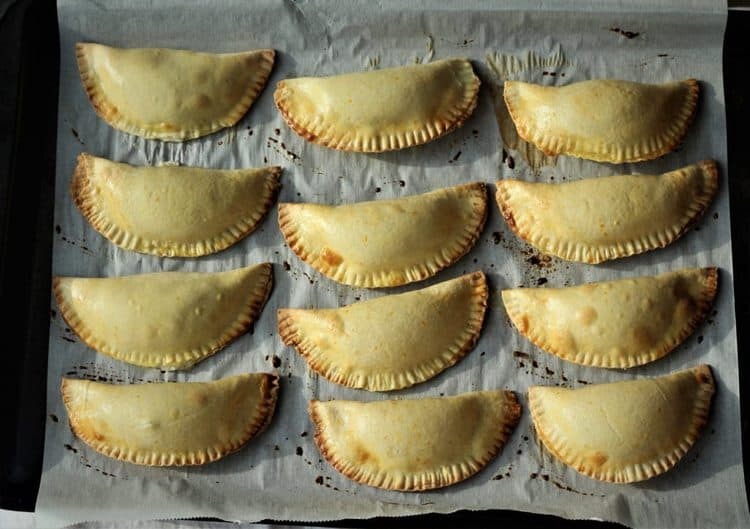 These little crescents of dough filled with a sweetened ricotta mixture can be fried or baked. I opted to bake my Sicilian Cassatelle with Ricotta in order to lighten up the recipe. They are definitely tasty baked as well as fried. As always, I did some research on typical Sicilian sweets for Carnevale. My mother recalls cannoli or pignolata were almost always made on special occasions when she was a child. I then checked with my sources back in Sicily who confirmed that other than cassatelle, graffe (similar to our sugar covered doughnuts) or chiacchiere (crispy fried dough strips covered in icing sugar) are commonly served. Do you detect a theme here? Basically everything is fried! Why are the tastiest foods always fried, sigh! Anyhow, given my love for anything with ricotta I decided to post my version of cassatelle. Let me tell you a bit about Carnevale. My mother described to me how they dressed up in costumes and received sweets on this day. In my mind I referred to it as the Italian version of Halloween. But it’s not quite the same. Carnevale is the Italian equivalent to Mardi Gras, Shrove Tuesday or Pancake Tuesday, however you choose to call it. It’s basically a final day of partying and indulgence before lent and the restrictions that come with it begin on the following day. The most famous Italian Carnevale celebrations occur in Venice and begin two weeks prior to Mardi Gras. Most of us are familiar with the famous Venetian masks associated with Carnevale. In most parts of Italy, including Sicily, Carnevale is celebrated on one day, this year on February 13th. Years ago, I recall my mother made a similar version of these. But unfortunately she hasn’t made them in years. She also did not call them cassatelle. 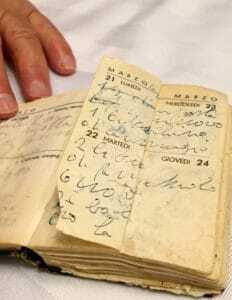 When she consulted her little black book of recipes, she found them under tortellini di ricotta. Sounds appropriate! By the way, have I told you about my mother’s little black book of recipes? Here it is! I’m sure she would not approve of this picture but I think it is priceless! This is the book of recipes I am attempting to document one recipe at a time so I thought it would be nice to show you what it looks like. It is a 1966 miniature agenda given to her by my aunt in Italy back in 1966, of course! Now back to the cassatelle. Watch my step by step video on how to make Sicilian Cassatelle with Ricotta! One of the few differences between her original recipe and this one is the use of Marsala in the dough. Not only does it give the cassatelle a nice golden colour, you can also detect the sweetness of the liqueur in the dough. If you don’t have Marsala on hand, you can substitute with red Port. 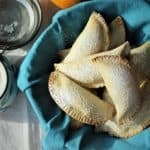 The filling consists of ricotta sweetened with sugar and a hint of cinnamon. You may add a handful of chocolate chips to the filling as well. I used a 12cm empanada mold to cut the circles of dough. Be creative and use whatever you have on hand with a similar size. I found an empty yogurt container with a similar sized opening. The amount of cassatelle you make will vary according to the tool you use to cut your dough. 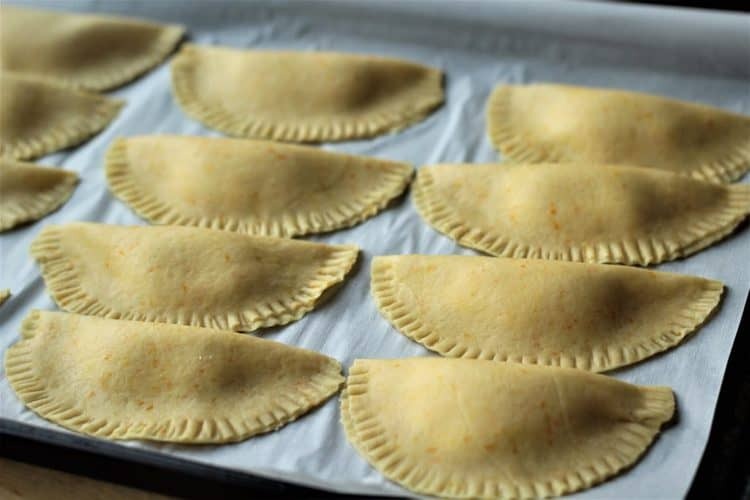 I made two dozen cassatelle with my empanada mold. Resist the temptation to overfill the cassatelle. About 2 tsp is plenty, otherwise the ricotta will ooze out when baking or frying and I’m speaking from experience! Make sure to crimp your edges with the tines of a fork to seal the edges well. 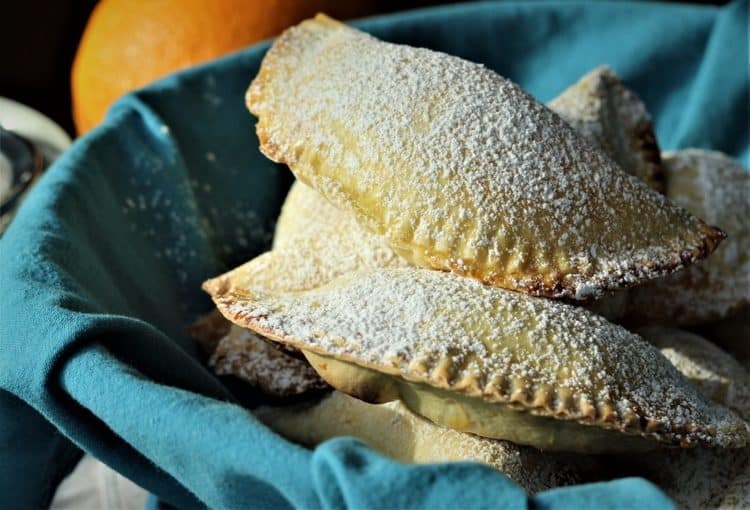 Due to the fresh ricotta filling, Cassatelle do not keep for very long. If you don’t serve them right away, keep them refrigerated and dust lightly with powdered sugar before serving. Cassatelle may be baked or fried. In my recipe I provide instructions for baking. 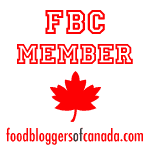 But if you wish to try them fried, fill a heavy bottomed pot with about an inch of vegetable oil. 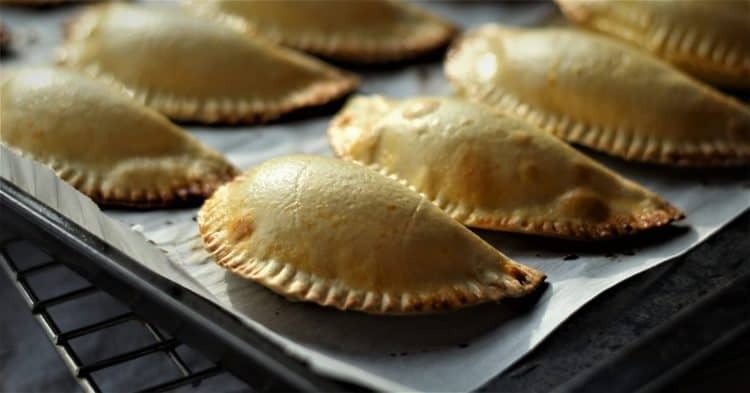 When the oil is very hot, carefully place a few cassatelle (do not overcrowd) in the pot and fry until the dough is golden and puffs up, turning the cassatelle once to brown both sides. This will take about 2 minutes. Place on a paper towel covered platter and cool slightly before dusting with powdered sugar. The filling will be very hot so wait before digging in! You’re now ready to make your Sicilian Cassatelle with Ricotta. Let me know how much you enjoy them by tagging me with your photos with @mangiabedda or #mangiabedda on Facebook or Instagram. Happy Carnevale to all! Sicilian Cassatelle with Ricotta are traditionally served during Carnevale in Italy before lent begins. 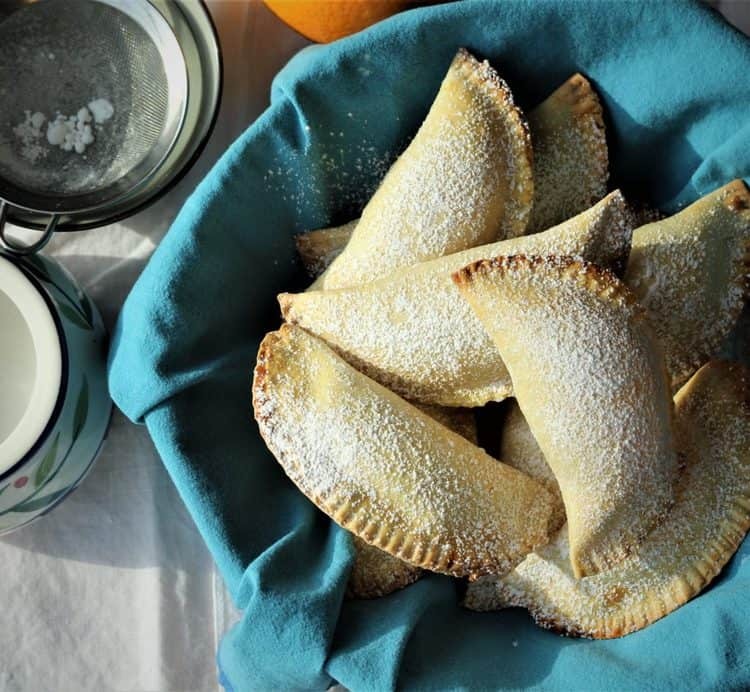 Indulge in these sweet, orange scented little morsels filled with a creamy ricotta filling which can be baked or fried! Mix flour, sugar and salt in a large bowl. Add the cubed butter and orange zest. Using your fingers, crumble the butter into the flour mixture until it resembles a course meal. Stir in the eggs and Marsala and shape into a dough. Turn the dough onto counter and knead for about 5 minutes until smooth. If the dough is dry, add a tbsp of water at a time, just enough for the dough to come together. Flatten into a disc, wrap in a sheet of plastic wrap and refrigerate for 30 minutes. Meanwhile, prepare the filling. In a bowl combine the ricotta, sugar and cinnamon and stir until smooth. Set aside in the refrigerator. Cut the refrigerated dough into 4 pieces. Using a pasta machine, roll the dough until the setting before last. Alternately, use a rolling pin to roll the dough until very thin, about 2 mm. Using a 12 cm shape (or approximately 12 cm) cut circles of dough. Keep covered until ready to fill to prevent from drying. Place about 2 tsps. of filling in the center of each circle of dough. Fold over the edges to form a half moon shape and use the tines of a fork to seal the edges well. Transfer to a parchment covered baking sheet. Continue with the remaining dough. Brush each cassatelle with the egg yolk/milk mixture. Bake for 20 minutes until golden in colour and lightly browned underneath. Allow to cool before dusting with powdered sugar. Red Port may be substituted for Marsala. A handful of chocolate chips may be added to the filling as well. I used a 12cm empanada mold to cut the circles of dough. Be creative and use whatever you have on hand with a similar size. I found an empty yogurt container with a similar sized opening. The amount of cassatelle you make will vary according to the tool you use to cut your dough. Resist the temptation to overfill the cassatelle. About 2 tsp is plenty, otherwise the ricotta will ooze out when baking or frying. Make sure to crimp your edges with the tines of a fork to seal the edges well. 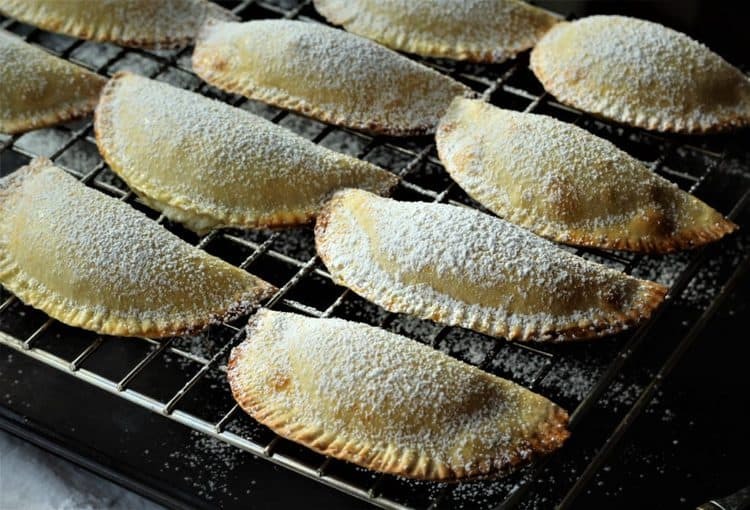 Due to the fresh ricotta filling, Cassatelle do not keep for very long. If you don't serve them right away, keep them refrigerated and dust lightly with powdered sugar before serving. Cassatelle may be fried. Fill a heavy bottomed pot with about an inch of vegetable oil. When the oil is very hot, carefully place a few cassatelle (do not overcrowd) in the pot and fry until the dough is golden and puffs up, turning the cassatelle once to brown both sides. This will take about 2 minutes. Place on a paper towel covered platter and cool slightly before dusting with powdered sugar. Saw your video, these look heavenly. Will try to make! Thanks for sharing! Thanks for checking out my video Pina! These cassatelle are delicious whether you bake or fry them. I hope you enjoy them and thanks for stopping by! Thank you Ella, I ‘m glad you enjoyed them and I appreciate your feedback! Have a great day!